Award-winning author, DiAnn Mills, has over forty-nine books in print and has sold more than a million and a half copies. She is a finalist for the 2008 Christy Award for her novel, Lightning and Lace. Six of her anthologies have appeared on the CBA Best Seller List. Five of her books have won placements through ACFW’s Book of the Year Awards 2003-2007. She is the recipient of the Inspirational Reader’s Choice Award for 2005 and 2007. DiAnn and her husband have four adult sons and lives in Houston, Texas. I thought this was a really heart touching fiction novel. It was set in Colorado in the 1880s and tells a beautiful tale of redemption, forgiveness, and love. The characters were real with all their faults, stubbornness, and ability to grow and change as the story progresses. I thought there was just the right amount of stubbornness and difficulty as there was redemption and problem solving. The story progressed at a very nice pace. Bert learns about hope, faith, and love that she never learned from her own family to become a beautiful character by the end. The author has a lot of talent in crafting a beautiful spiritual love story with good and bad characters that are all intriguing. It is an unforgettable tale that will capture your heart even after you are finished reading it. I look forward to reading more by this amazing author. I would definitely recommend this to anyone who loves historic love stories with a spiritual twist. 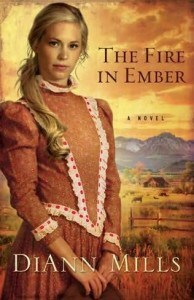 Buy It: You can buy The Fire in Ember for $14.99 US. Disclaimer: This book was provided for review for free. I was in no way compensated for this post. Everything written is my own thoughts and feelings. Thank you!